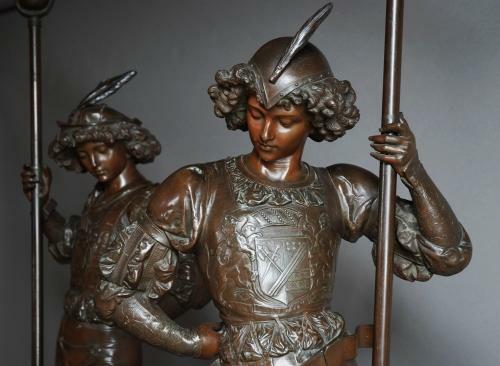 A large pair of superb quality late 19thc finely patinated spelter courtier figures in the manner of Miroy Freres, France. These figures are of excellent quality and are depicting two young male courtiers holding torches. They are dressed in traditional Medieval clothing, both with armorials to their doublet & hose and one with a French horn on his shoulder. They both are wearing hats with feathers. They are both supported by superb Royal Doulton painted & glazes bases from a similar period (late 19thc). These figures were originally made as gas lights but could easily be converted to electric by a qualified electrician. These figures graced the entrance hall of Baddow Park House in Essex for over 100 years and had been the property of the family since the late 19thc. A similar example to these figures can be found in 'Great Exhibitions 1851-1900' by Jonathan Meyer page 188, plate E43. The Miroy Freres (Brothers) was a family business spanning a couple of generations and worked in Paris for many years, known particularly for their bronzes & clocks. Ernest & Victor opened a shop in London after success at the London Exhibition in 1851, carrying on the tradition of producing wonderful bronzes and clocks. These pieces are both in very good condition and are stunning examples.